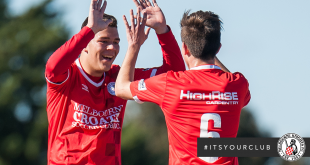 An emphatic four goal demolition of the Bentleigh Greens has seen the Melbourne Knights rocket into the top five of the Alanic Victorian Premier league. The home side produced by far their best performance of the season, dominating from the first whistle to last and perhaps unlucky not to have put several more goals past a deflated and lacklustre Bentleigh outfit. Ivan Duzel was forced to make two changes to his side, with Junior De Camargo and Mathieu Welmant injured, Adam Zilic and Craig Sweeney were called up to form a makeshift Knights defence. The Knights could and should have opened the scored barely 45 seconds into the match, Anthony Colosimo’s strike from outside the box was well trapped by Josip Magdic, with all the time in the world, Magdic wastefully blasted his shot over the bar. However Magdic made up for his miss on soon after, by supplying Ben Surey a ball to give the captain the opportunity to pick a defence splitting pass to Daniel Dragicevic, who managed to round Kennedy in the visitor’s goal and finish into the open net to give the Knights a 8th minute lead. In the 18th minute Josip Kozic fed the ball to Dragicevic on the edge of the box, with some quick footwork the striker turned his marker and unleased a left foot strike that beat the keeper but not the crossbar. Just minutes later, Colosimo delivered a telling cross from deep that was met by the head of a diving Magdic, Kennedy was left flat-footed and was grateful to see the header clip the outside of the upright and go wide. The pace of Dragicevic was causing the visitors plenty of headaches, and in the 33rd minute he was once again able to get past the Bentleigh defence, cutting in from the by-line Dragicevic looked to have set up Jean Dubois with the easiest of goals had it not been for some desperate defending from Laurie to block the shot and keep the Greens in the match. Bentleigh could have made the Knights pay for not taking their chances late in the half, when a poor clearance from the Knights defence fell to the feet of Nicholson in the six yard box who just couldn’t get his shot away in time. Their was still time for another chance for the home side to double their lead, as Dubois set up Magdic who saw his shot from inside the six yard box blocked, the rebound falling to Leo Shin who also saw his shot from a similar position blocked on the line, leaving the home side and their fans pondering how this game wasn’t already over. Bentleigh coach Andy O’Dell opted to play just the three in the back in the second half, however they still resorted to playing long balls which were easily dealt with the Knights defence, in particular Craig Sweeney who was playing in an unfamiliar centre back role. The Knights were finally able to kill the game off in the 77th minute, A deep cross from Dubois was headed across goal from Dragicevic and into the path of Anthony Colosimo to nod home from close range. With the game seemingly over as a contest, Ivan Duzel threw on Yusuf Yusuf for the last 5mins, and the substitution was an inspired one. Yusuf was on hand to finish from close range after Kennedy could only parry a Dubois shot into the path of the striker. There was still time for Yusuf to grab a double, as Rudi Saglam’s cross was deftly glanced on by the striker, leaving Kennedy once again flat-footed who could only watch the header hit the inside of the post and into the back of the net. Meanwhile, the Melbourne Knights Youth team continued their great run of form under new coach Micky Colina. It is the third game in a row that the Knights have scored 5 or more goals, the first being against Springvale (5-1), V.TC. (6-1) and 5-2 against Bentleigh. First team prospect Brandon Zezovski netted a hat-trick while Tasmanian midfielder Amadu Koroma got himself a brace, ending the contest against a young Bentleigh side. The win sees the Knights move into second position six points behind Oakleigh Cannons who have stretched their overage player limit week to week to accomodate for their large squad. The win sees the Knights leapfrog the Greens and move into the top five, next week they face their toughest test of the season thus far when they take on South Melbourne at John Cain Memorial reserve on Sunday evening, whilst Bentleigh will look to return to the winners list when they host bottom of the ladder St Albans on Friday night. Melbourne Knights: 1. Martin JOHN, 3. Ryan FILIPOVI?, 4. Ben SUREY (C), 5. Leo SHIN (Rudi SAGLAM 71′), 8. Josip MAGDI? (Yusuf YUSUF 88′), 10. Josip KOZI?, 11. Anthony COLOSIMO, 14. Jean-Charles DUBIOS, 18. Daniel DRAGI?EVI?, 19. Adam ŽILI? (Josip FRANJI? 85′), 22. Craig SWEENEY. Un-used Subs: 21. Aaron ROMEIN, 20. Jacob COLOSIMO. Bentleigh Greens: 1. Kyle KENNEDY, 3. Thomas MATTHEWS, 5. Steve LAURIE, 6. Stephen DOWNES, 8. Wayne WALLACE, 9. Sean MCLLROY, 10. Hayden DOYLE, 11. Scott BULLOCH (Adam FADJLEVI? 69′), 14. Aron WILFORD, 22. Stuart NICHOLSON, 17. Jack WEBSTER (Craig SMART 69′). Un-used Subs: 31. Luka GAVALAS, 26. Jonathan BOUNAS.